This evening AltspaceVR has announced it will be closing its doors for good on August 3rd. Founded in 2013, the social VR platform was one of the first to come online and connected tens of thousands of users monthly across a range of headsets. AltspaceVR sent an announcement of the platform’s shuttering to Road to VR by email this evening. It is with tremendously heavy hearts that we must let you all know that we are closing down AltspaceVR. The company has run into financial difficulty and we can’t afford to keep the virtual lights on anymore. This is surprising, disappointing, and frustrating for every one of us who put our hearts into AltspaceVR. We know it will probably feel similarly for you. 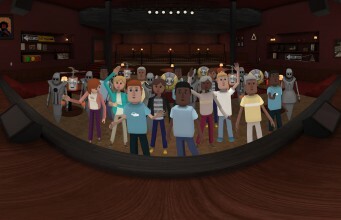 We know many of you have created vibrant relationships in AltspaceVR, so please use the next few days to connect with those friends and hopefully find another way to stay in touch. Among what’s now a fairly vibrant range of social VR platforms, AltspaceVR had an early mover advantage, opening it’s doors long before the launch of the consumer versions of the Oculus Rift and HTC Vive. The app would eventually be supported by those VR headsets and more, including a monitor-mode for those without a headset. In addition to community events, the company also hosted their own marquee events, bringing the likes of Drew Carey, Reggie Watts, Janeane Garofalo, Bill Nye, and many more into the virtual world to interact and perform with a virtual audience from around the globe. According to Crunchbase, AltspaceVR has raised nearly $16 million in venture funding over the course of its run, and from significant investors too, like Comcast and Tencent. Though 35,000 users monthly isn’t anything to sneeze at, the company had yet to begin monetizing the platform, meaning it was relying on venture capital runway to continue building the service. Without being able to raise more money, there’s no way to “keep the virtual lights on,” as the company put it. So the AltspaceVR platform itself will close its doors on August 3rd, but what about the company itself? The company plans to host a “final farewell party” on the 3rd, the culmination of which will officially bring the platform to a close; the precise timing of the party is not yet known. More details, including an FAQ, can be found in a Goodbye blog post on the company’s website. The post AltspaceVR, One of the First Social VR Platforms, Is Shutting Down Next Week appeared first on Road to VR.